Cycling is a simple pleasure – a bike can be acquired for next to nothing and you don’t require a licence or any specialist equipment – but whatever type of cyclist you are, it pays to know your rights and responsibilities in law. We’ve teamed up with leading law firm Shoosmiths Access Legal to provide advice about cycling and the law and provide key tips. If you are a cyclist seeking compensation following a road traffic collision, it is vital that you choose a law firm that understand cyclists, the laws affecting them and the injuries and losses cyclists can suffer. Should you be unfortunate enough to be involved in a collision or crash, make sure that the solicitors you use have long-standing partnerships with leading treatment and rehabilitation providers, cycle specialist accident investigators and barristers who specialise in this area of work. They can even help when the other parties involved in the road traffic collision are uninsured or untraceable. When you invest in cycle insurance from the ETA, you enjoy a host of benefits including new-for-old replacement (whatever the age of your bike), protection against accidental damage, third party cover up to £1m and free legal advice. The Good Shopping Guide this year nominated us Britain’s most ethical insurance company. If you have any questions about cycling and the law, you can contact our dedicated helpline on 0845 389 1050. 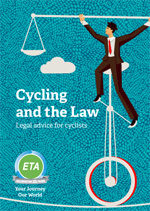 We’ve transformed Cycling and the Law into a free e-book, making it even easier to read, download and share this handy guide for cyclists. Just click here or on the front cover (right) and you’ll have full access to the e-book. Can I ride an electric bike rated at over 250W on the road in Britain? Is it legal for a cyclist to ride across a zebra crossing? How old does a child need to be before they can legally cycle on the road? What are a cyclist’s main rights and responsibilities on the road? What is the law regarding riding two or more abreast? If there is a cycle track along a main road, am I obliged to use it as a cyclist? In the event of a collision, can motor insurers seek to reduce payments for compensation if they argue the cyclist had the option to use a cycle lane? Can cyclists be booked for speeding? Do I have to obey the Highway Code on a bicycle? What’s the law on cycling and alcohol? Is it ever legal to run a red light? Can I cycle in a pedestrianised zone? Following the proposed changes to the law, should a cyclist win their case, are they able to recover costs for legal representation? Are cyclists with a claim under £5,000 are being encouraged to pursue the claim through the small claims court without legal representation? Can you explain the changes to raise the small claims limit for personal injury from £1,000 to £5,000 and remove the right to recover general damages for soft tissue injuries? Can a cyclist be counter-sued if they make a claim for compensation against a driver? Can I claim for damage to my bike and other equipment and accessories that were damaged as a result of a crash? Can I make a claim if I have been injured by a vehicle that didn’t stop? Can I make a claim if I have been injured by an uninsured driver? Is there a legal requirement to be qualified as a bicycle mechanic to service / build bicycles used by the general public? Are there any (by) laws about locking bikes to municipal, i.e. public or council, lamp posts, railings, signposts, etc? What equipment is needed to be fitted to a bike to make it legal to ride on British roads? How does the law regard helmet cam evidence? Can I cycle while using my mobile phone? What’s the legal position on bike lights? Is it the law to have a bell on a bicycle? What should I do if I am hit by a car? What should I do if a dog without lead causes me to crash? What are a cyclist’s rights in a road rage incident? Can a cyclist be sued for causing a collision? What is the law on carrying children when riding an electric bike? I ride a tandem on occasions with a blind person – what is my liability in law? What can I tow with my bicycle? Can I carry people on my bike? It is not illegal ( some local bylaws may apply) to ride a pedal cycle across a zebra crossing, but rule 79 of the Highway Code says cyclists should dismount and wheel their cycles across a pelican, puffin or zebra crossing. You ought to comply with this rule as, should you injure a pedestrian when cycling across, they could sue you for compensation. The fact that you did not follow the rules for cyclists in the Highway Code would make it far more likely that the injured party would win their case against you. It should also be noted that sections 28 & 29 of the Highways Act create the offences of dangerous, careless and inconsiderate cycling, which could apply if you failed to take care when using the crossing if you choose to cycle across. Equally, in law if you did cycle across a zebra crossing then you are not a ‘pedestrian’ so a motorist who fails to give way to you won’t be committing an offence if they cut in front of you – case law precedent if you are interested is Crank v Brooks  RTR. However, rule 80 of the Highway Code does permit cyclists to ride across at toucan crossings which allow cyclists and pedestrians to share the crossing space and cross in designated lanes when the appropriate light signals indicate it is safe to do so. There is no prescribed legal minimum age concerning how old a child must be before they can use or ride a pedal cycle* on a public highway. Bear in mind that, depending on the child’s age, parents can be held responsible for the actions of the child. So if for example the child causes an accident the parents would be the ones who have to pay compensation to the other injured party. Likewise if the child is injured by a third party, the parents could be held wholly or partly responsible for failing to exercise reasonable supervision of their child and could find themselves as co-defendants in a legal action brought by their child for compensation. So whether you allow your child to cycle on the road will depend on your judgment about their ability and confidence, but if they are still using a bike with stabilisers they are probably far too young. Parents certainly ought to cycle with their children until the youngsters feel confident enough to handle the roads on their own. It’s a good idea for your child to take the various levels of instruction available through the Bikeability scheme before they set out on the road. *’Cycle’ is defined by the Road Traffic Act 1988 s 192() as a ‘bicycle, tricycle or a cycle having four or more wheels, not being in any case a motor vehicle’. The rights and responsibilities of cyclists on the road ( addition to others which apply to all road users) are contained in the Highway Code sections 59 – 71. There are no real differences from those of any other road user. There is no law as such against doing this and it is not outlawed specifically in the Highway Code. You are, however, obliged to be considerate to other road users and so generally riding two or more abreast would not be recommended in built-up areas. In less busy areas, or riding on roads like narrow country lanes, if you are cycling two or more abreast and are approached by a vehicle from behind it is recommended that you return to single file to allow that vehicle to pass. In the unreported case R. v Cadden – Unreported August 8, 2006 ( Ct ()) the Court initially held that Mr Daniel Cadden contributed to the negligence by not using the designated cycle lane. However, the appeal Court overturned this decision and held the verdict that it is not a legal requirement for cyclists to use cycle lanes but as above, it is dependent upon experience and skills. The prominent decision of the Courts is not a concrete precedent and was judged upon whether the claimant was aware of their responsibilities to others and whether he was impeding traffic by not using the cycle lane at the time. Essentially, it comes down to the reasonableness of a cyclist’s behaviour in the circumstances. Cyclists can’t be booked for speeding, but might be fined for ‘cycling furiously’ or ‘riding furiously’ which is an offence under the 1847 Town Police Clauses Act. However, cyclists can be convicted for ‘wanton and furious driving’ under the Offences Against the Person Act 1861 ( amended by the Criminal Justice Act 1948 (. 58), s. 1()) if they cause bodily harm to any person. They are then guilty of a misdemeanour and could, at the discretion of the court, be imprisoned for up to two years. It’s not a legal absolute, but it is always advisable to do so. In law, a bicycle is defined as a carriage for use on the highway, but cyclists are not in charge of ‘mechanically propelled’ vehicles so, in law, do not have to adhere to exactly the same rules as motorists, including ‘drink drive’ rules. That is to say, is under the influence of a drink or a drug to such an extent as to be incapable of having proper control of the cycle. If you ride drunk you risk endangering yourself and possibly others and can be fined by up to £2,500. No. The only possible mitigation in law might be if your life was in immediate danger and there was genuinely no alternative. If there is signage prohibiting cycling you should not cycle, but often such signage is hidden away, missing or misleading. The Department for Transport’s Code of Conduct for cyclists says that in pedestrianised areas, only ride your cycle if there aren’t too many pedestrians about – otherwise dismount and push it. If the government adopts the present fixed cost scheme for small claims it will be a fixed fee and if your customers seek legal presentation they will be responsible for any shortfall. We always advise clients who have a small claim whether it is a Personal Injury, Contract or any other claim that the costs that they would have to pay would be disproportionate to the sum recovered. Theoretically yes, as we anticipate that many personal injury lawyers will exit the market as the costs recovered will not cover their operating costs. Changes are expected to be in place by 2017. At the moment (Early December 2015) we do not have the details of the government’s proposals and the devil will be in the detail. The ABI have been successful in lobbying the government in relation to “whiplash injuries” therefore if the third party insurers argue that a soft tissue is a “whiplash Injury” then on the information published by the government the third party insurers will only pay for physiotherapy treatment. Yes. There can be a counter-claim by the driver who is the defendant in an action you take for any damage to his vehicle caused by you as a cyclist in the collision. This can include repair costs and replacement vehicle hire costs. You can not only claim for your injuries, but also the cost of bike repair or replacement and the cost of accessories and clothing damaged in the crash. Incidentally, you can also claim for lost income caused by time off work and the cost of any treatment required as well as help provided by family and friends while you are recovering. Yes. Claims made via the Motor Insurer’s Bureau () also cover untraced drivers. The MIB will make an award for compensation to the victim of a negligent untraced driver in respect of personal injuries. You may also claim property damages for a collision that occurred on or after 14th February 2003 provided the incident is reported to the police within five days of the collision if the vehicle remains untraceable. It is helpful to contact MIB as quickly as possible, but personal injury claims against either uninsured or untraced drivers can be considered by the MIB within three years of the date of the collision ( months in respect of property damage). Claims can still be made via the Motor Insurer’s Bureau (), which is a body set up by all the insurers in Great Britain to compensate victims of uninsured drivers. The process follows much the same procedure as would a normal personal injury claim. If the collision happened after 15th April 2011 and you suffered a significant personal injury ( as being admitted to hospital for 4+ consecutive days) then property damages will be paid in addition to compensation for personal injury. Our research does not suggest that there is a legal requirement that an individual has to be “qualified as a bicycle mechanic to service/build bicycles used by the general public”. One has to ask the question what is meant by “qualified” as it is not a requirement to be a qualified mechanic to service a car ( number of people service their own vehicles), however an individual has to have qualifications to carry out/issue a valid MOT certificate. That said, if an individual services a bicycle and something goes wrong there may be a claim in Civil law and the test is the ‘reasonable competent test’ and whether there is a claim for ‘breach of contract’ or ‘negligence’ if something goes wrong. This is a difficult question to answer as there is no general law that gives a cyclist the right to lock their bike to railings, signposts or any other municipal or council-owned signage or street furniture. Obviously, specifically designed bike racks and parking stands supplied by local authorities can be used, and many ‘expert cycling sites’ claim that, if there are no suitable parking stands available, you can use secure immovable street furniture such as railings or lamp posts to lock your bike provided it isn’t causing an obstruction to passers by. Whether you can in fact legally do this is dictated by local Bylaws. Bylaws are laws made by a local authority and only apply within a specific geographical area. They are usually only created when there is no general legislation that deals with particular matters of concern to local people – like too many bikes cluttering up public railings for example. You can check with the appropriate local authority which should have a numbered list of their Bylaws. Always check for signage saying you can’t lock your bike against railings or street furniture. If it says any bike locked there will be removed, that’s usually what happens! The only right you have on the highway is to pass and re-pass. There are offences of obstruction, public order damage etc that you could lay yourself open to. So, while it may be legal to secure your bike to street furniture if the Bylaw says so, if there is no Bylaw you are at risk from laws protecting property rights. Chaining your bike to the property (railing etc) of another could give rise to claims for compensation if you cause ‘damage to public property’. The courts have interpreted the term ‘damage’ liberally and such damage need not be need not be visible, tangible or permanent. So check the position with your local authority by getting information about the relevant Bylaws, but if designated parking stands are available, then use them rather than risking your bike on a lamppost, road sign or railing. These alternatives will probably be less secure than a proper bike stand in any event. Your bike should be in good condition and adequately maintained and it is not compulsory to wear a cycle helmet in Britain. Essentially the only items of equipment that must be fitted to legally ride a bike on British roads are brakes and lights. The Pedal Cycles ( and Use) Regulations 1983 only stipulate that every pedal cycle ( are slightly different for electrically- assisted bikes) should have two braking systems ( can be a back pedal-operated rear brake). The Road Vehicle Lighting Regulations 1989 ( amended several times) stipulate that bikes ridden at night must be fitted with white front and red rear lights, flashing or steady, as well as a red rear reflector. All bicycles made after October 1st 1985 must also be fitted with amber pedal reflectors ( on each pedal) when being ridden on a public road between sunset and sunrise, although fitting such reflectors is almost impossible with many ‘clipless’ pedal styles. It’s important to comply with these regulations as any slight illegality with respect to your lights or reflectors may be regarded as contributory negligence should you be involved in an accident at night. Bikes have to be fitted with bells while in the bike shop, but there is no legal requirement to fit or use them once on the road. The Highway Code merely suggests that cyclists ‘should be considerate of other road users, particularly blind and partially sighted pedestrians. Let them know you are there when necessary, for example by ringing your bell.’ Any other ‘audible warning’ – horn, rattle, duck call or the human voice – would do. There is no reason why helmet cam footage cannot be admitted as evidence like CCTV is used. It is likely that a witness statement would have to accompany the helmet cam footage and it would have to be downloaded to a CD with a certificate (countersigned by a solicitor) stating that it had not been altered in any way from its original digital format. A bicycle is a vehicle, but according to the Road Vehicles ( and Use) Regulations 1986, amended 2003, it is only illegal to drive a motor vehicle while using a mobile phone. There is nothing about bicycles in the phrasing so, in effect, cyclists are exempt from this extremely sensible law. That doesn’t mean cycling while phoning or texting is not dangerous and you could be pulled over for a related ‘not-paying-due-care-and-attention’ offence. Bikes ridden at night require front and rear lights, flashing or steady. At night a bicycle must also be fitted with a red rear reflector ( amber pedal reflectors, if manufactured after 1/10/85). According to the Road Vehicle Lighting Regulations () 1989 ( in 2009), all bicycle pedals must be fitted with reflectors ( on each pedal) although fitting such reflectors is almost impossible with many ‘clipless’ pedals. The RVLR regulations are seldom enforced, but if you are involved in a night-time collision, any slight illegality with respect to your lights or reflectors may be regarded as contributory negligence on your part. No – it’s desirable, but not a legal requirement. Bikes at the point of sale have to be fitted with bells, but there is no law saying they must be fitted to bicycles no longer on shop display. Any other ‘audible warning device’, such as a whistle or the human voice would do. A polite ‘excuse me’ can often come across as a lot less aggressive than the insistent tinkling of a bell or the blare of a horn. Be safe Get yourself out of the road and to a footpath or kerbside or somewhere safe if you can. If you’re unable to move, ensure you’re visible and try to attract help from passersby. Call the police and ambulance Always contact the police and call an ambulance if you are injured. The police can help with exchange of details and their reports could prove crucial. Get the details of the attending police officer and an incident reference number. Exchange details You must exchange personal and insurance details after a collision. You may not have insurance cover, but all motor vehicles on a public road should do. Get names and addresses, vehicle registration number as well as make, model and colour. Get witnesses Get details of any independent witnesses as well as the driver of the vehicle that hit you. If you can’t do this yourself, ask a passer-by for help. If the vehicle that hit you didn’t stop, still get witness statements as you can claim via the Motor Insurer’s Bureau () who will pay out if the accident was a ‘hit and run’ or the driver cannot be traced. Get photographic evidence Take photos ( time and date stamped) on your phone of the vehicles and the scene ( from junctions, road markings or signs) precisely as the accident happened. Don’t let the driver of the vehicle that hit you move it before you take photos. Ask the police if there is CCTV footage showing your collision. If you have a helmet cam, video from that can also be used as evidence. Put everything down on paper When you can, write a full account of the accident and draw a sketch plan. It’s always worth asking for a copy of the police reports too. Get checked out by your GP No matter how minor your injuries may seem, always visit your GP and get checked over at the earliest possible opportunity. Keep all receipts Keep receipts/bills/estimates for the cost of repair/replacement to your bike, clothing, helmet and accessories and the damaged bits of your bike. Keep records of costs you’ve incurred for treatment, travel to medical appointments or lost earnings. Dog owners have a duty to keep their pets ‘under control’ and they are liable to make good any ‘foreseeable’ damage caused by their animal. A dog is considered ‘under control’ if it is on a lead held by someone able to control it. It isn’t necessary for dogs to be muzzled or leashed at all times, but they should be kept on a lead on the highway and on land where livestock is present. Councils may also have bye-laws to indicate areas where leashing is required. It is a criminal offence to allow a dog to attack or cause serious injury to a person or livestock. Dogs that behave dangerously may be seized by the council dog warden and their owners prosecuted. The animal may be destroyed if a magistrate considers it is a danger to the public. If a loose and uncontrolled dog causes you to crash while on your bicycle, then provided you can identify the owner, you can pursue a civil personal injury claim against the owner/person responsible for the dog. The normal rules relating to claims based on negligence and/or breach of statutory duty apply. The pet owner or handler owes a duty of care and is liable because they could have easily foreseen what was likely to happen given that their dog was off the leash, but did not take any ‘reasonable measures’ to prevent it happening. Even if the accident was caused by a dog that had ‘escaped’ (.e. the owner is nowhere within sight to exert any control) then the owner is still responsible for any foreseeable damaged caused by the straying pet if it can be shown that they failed to take reasonable steps to keep the dog secure. The claim can cover your pain, suffering, medical treatment as well as loss of earnings caused by time off work, inability to perform cherished tasks and damage to your bike, clothing or equipment. The only other issue to consider would be whether the dog owner had insurance cover that would pay out if your claim is successful. If the dog owner has no insurance or no money to pay what you may be awarded, it is worth checking with your solicitor to see if your existing cycle, car or household insurance policy contains a ‘reverse indemnity clause’. This type of cover will pay out compensation awarded to you by a court if the party at fault has no insurance cover, no money or assets and fails to pay up. You may need to act quickly however if you plan to rely on reverse indemnity as there could be an early notification requirement built into the insurance policy. They are the same as any other road user’s rights in this situation. If a criminal offence has been committed it should be reported to the police immediately for them to investigate the matter for a potential prosecution. If a vehicle has been used as a ’weapon’ then the Criminal Injuries Compensation Scheme will apply and can be used as an alternative to any civil claim, but a civil claim would be the better option to pursue in terms of damages payable if successful. Yes. If the cyclist was indeed responsible for the crash, should an injured party decide to take things to court, a cyclist can find themselves in the position of ‘defendant’ rather than ‘claimant’ in any civil action for personal injury compensation. Of course the relative damage a cyclist could do to anyone or anything apart from another cyclist or a pedestrian is minimal. In cases where cyclists have been sued for damages the claimant is most often an injured pedestrian or another cyclist. That’s why it is desirable to have adequate insurance which includes third party public liability cover. Without it, if you find yourself on the losing side of a compensation claim, that money ( could amount to several thousands of pounds) will have to come out of your own pocket. In the event of an accident whilst on your tandem, it would be for your insurance company to prove fault based on the circumstances, and liability would be established then. Essentially, both you and your stoker should be insured for personal liability in the event of an accident. There is no legal requirement to have a DBS certificate in order to use a tandem with visually impaired persons. With regards to making your stoker sign a disclaimer, in the event of an accident, this disclaimer cannot exclude your liability as it is not possible to exclude liability for personal injury under the Unfair Contract Terms Act 1977. There are no legal restrictions on what can be towed by a pedal cycle and there is no restriction in law concerning carrying children in trailers. You may be required, if asked, to satisfy the police that your brakes will stop you sufficiently and Road Vehicle Lighting Regulations mean that you may have to fit a cycle-type rear lamp and a triangular reflector ( type III or IIIA). According to the Road Traffic Act, two people are not allowed to ride on a single bike ( if it’s a BMX with ‘stunt pegs’) unless the cycle is ‘constructed or adapted for the carriage of more than one person’ – i.e. a tandem or a bike with approved equipment such as child seats, properly fitted. If you do carry a passenger on a bicycle not constructed or adapted for the purpose, you are breaking s.24() of the Road Traffic Act, as is your passenger ( they are under the age of 10 and therefore below the age of criminal responsibility). The maximum penalty for this offence is a fine of £200.